Simon Lee has been in the film industry as a Lighting Director for more than 30 years having worked on many well know productions such as Babe, Moulin Rouge and recently the Nicole Kidman & Hugh Jackman movie 'Australia' and as a stylist I think I am so lucky to tap into his knowledge and know how being as he is not only a good friend of mine, he's a local, he lives here in the Southern Highlands. 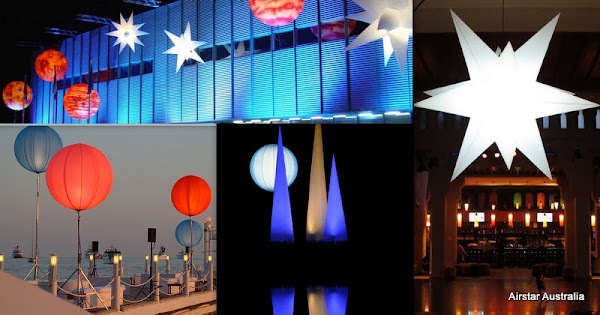 We had just worked at the same event together at Darling Harbour and I had seen his lights there on display but I had no idea of what could be created until this week when he was showing me some of his latest events. Now.... they've been discovered by art directors, other stylists (hmmm) event and wedding coordinators and some pretty impressive businesses in the country and they're popping up everywhere. They're big, they're beautiful, they're light weight and they illuminate the most wonderful soft light and look at all these amazing colours. However, I do love the white ones, they look like planets in the universe at night, (as seen above at the fashion parade). Scoop: I hear there is a pearl company that has used them for their events in Sydney and they choose the pearl colour balloons of course! You may have seen them at the Melbourne Cup last year or in Sydney on New Years Eve at Darling Harbour , look at those beautiful colours. 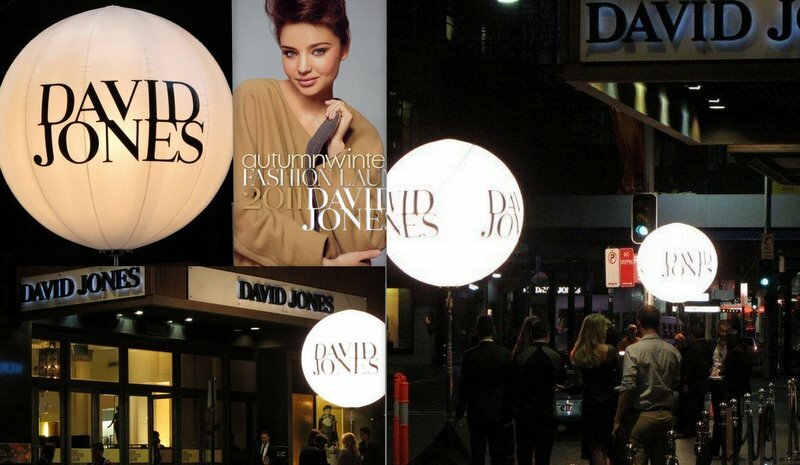 ...and the most recent event which was last night at the Autumn Winter Fashion Parade at David Jones in Sydney, where you there? ...did you see them? Have a look at the set-up of this Amway event held here in Sydney last month, it is amazing and it was decorated just for a dinner event! Can you count how many round tables there are on the floor, that's a massive amount of table settings. Hint..there were 2500 guests. The creative event company Triumph Leisure Solutions (TLS) had Airstar's beautiful lights transformed into giant sea creatures that gently floated above everyone up in the dome. I also have to share this with all of Susan's Tablescape party guests, imagine setting all these tables. Anything is possible with these lights, look what they added to them to created these creatures, I'm going to use them at my future weddings that I create. I have so many ideas of what I can do with them. what do you think? are you in town? I adore this lighting Coty, I can see a summer garden party, magically lit up overhead with some of these amazing blobs of light floating overhead. Suddenly I want a luminous jellyfish. Extraordinary...they also remind me of jellyfish...wouldn't the reflection of these objects be wonderful over water!!! Lovin those lights. They would be perfect in the right place. Just spectacular, Coty! You always take us to the most amazing places!